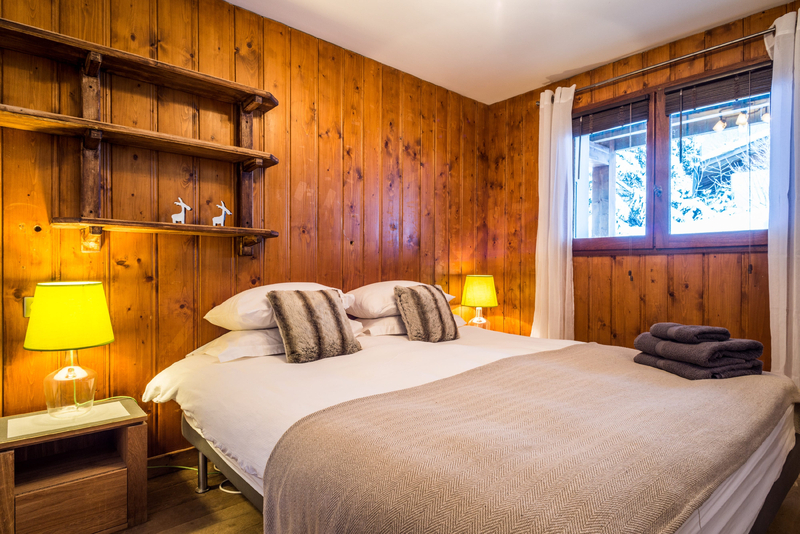 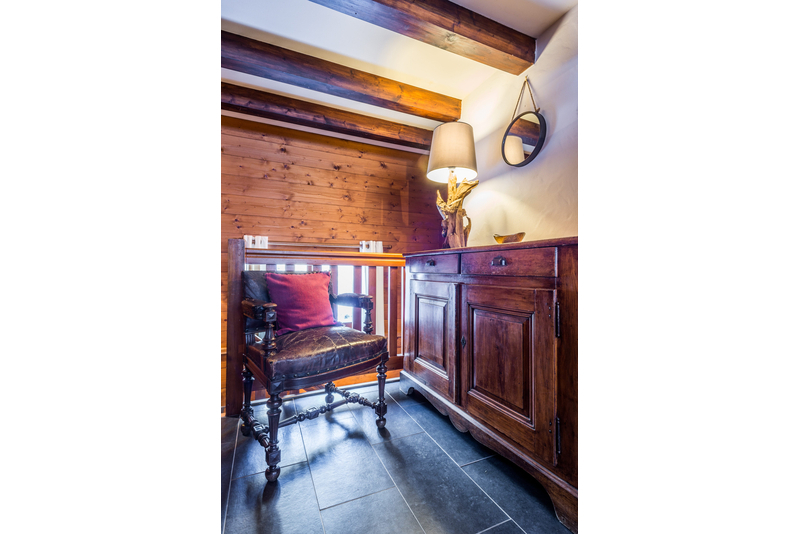 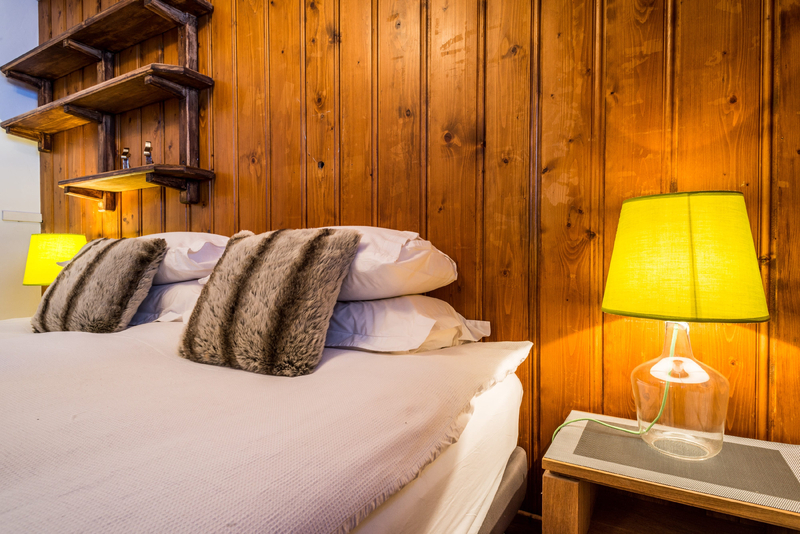 Traditional alpine chalet recently renovated but retaining a comfortable, welcoming atmosphere. 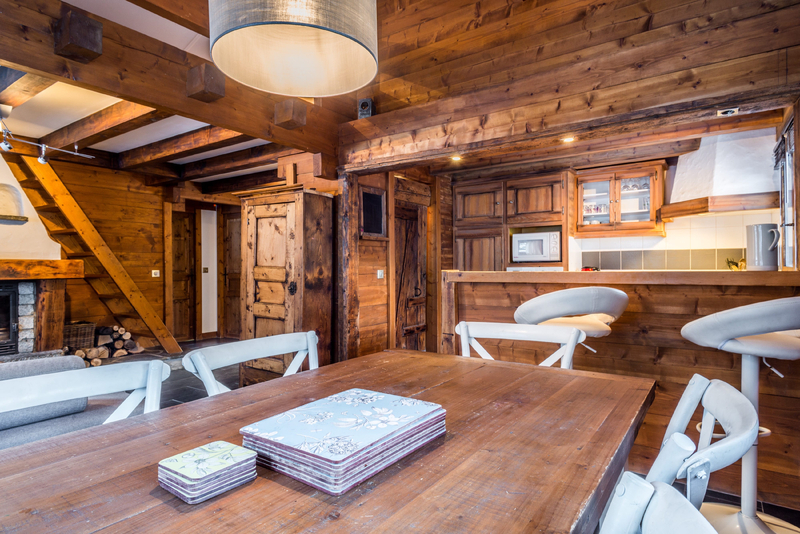 Chalet Charme is a classic alpine chalet, traditionally built with wood and granite, modernised and updated in recent years. 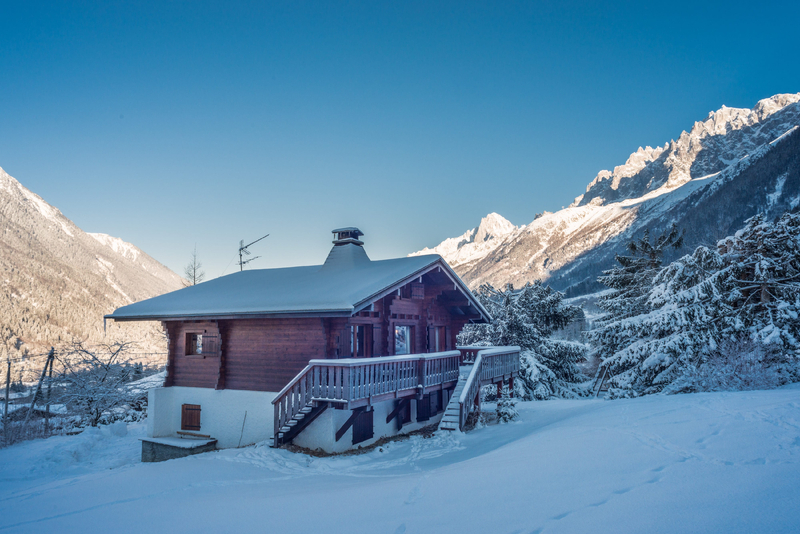 The chalet has really impressive views of the Aguille du Midi and Arve valley. 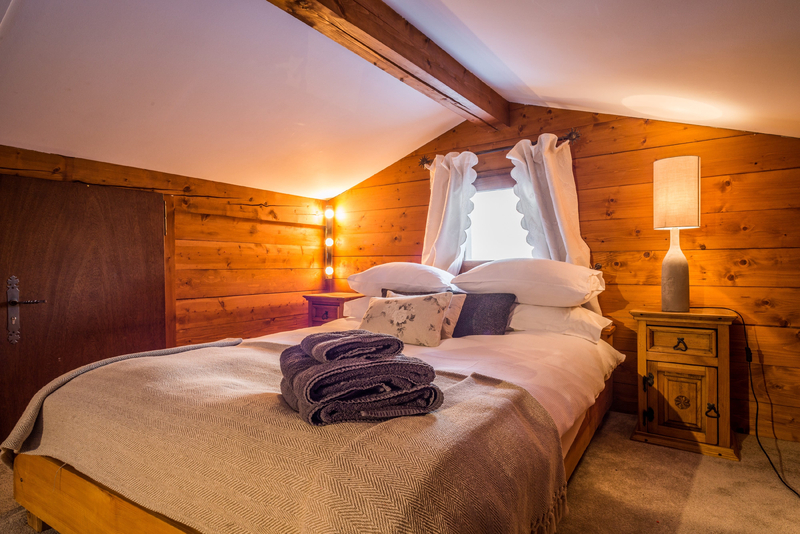 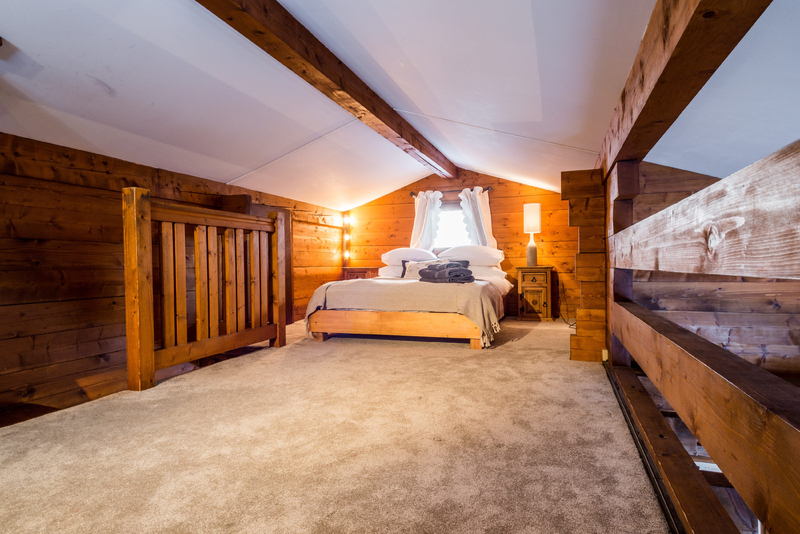 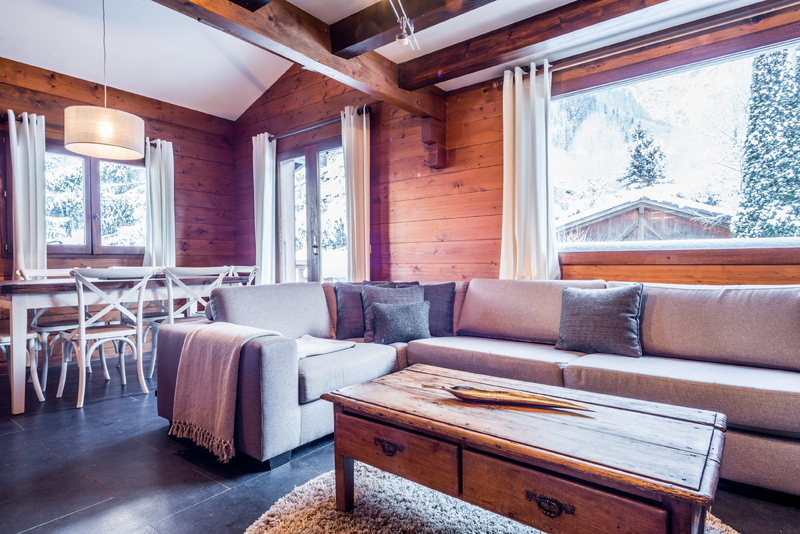 In winter with underfloor heating and a wood burner Chalet Charme is very warm and gives you the traditional chalet feeling. 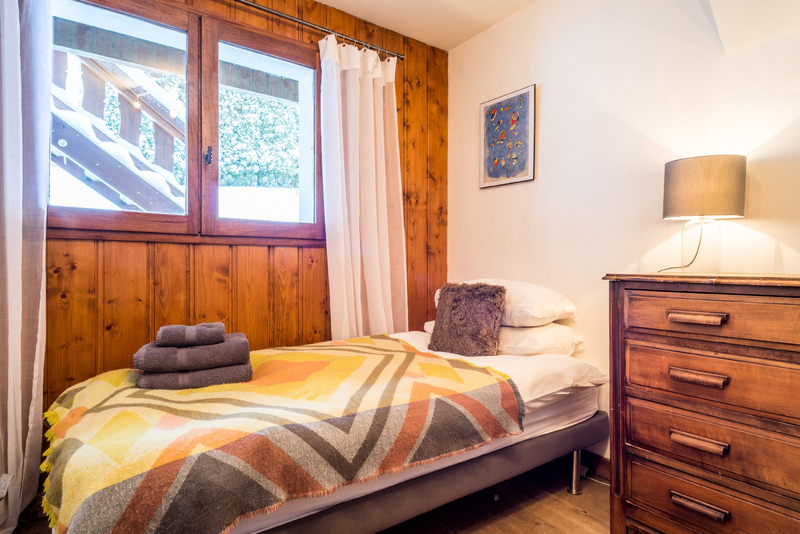 In summer the chalet is bright and airy and catches the sun right to the end of the day which is longer than most places in Les Houches. 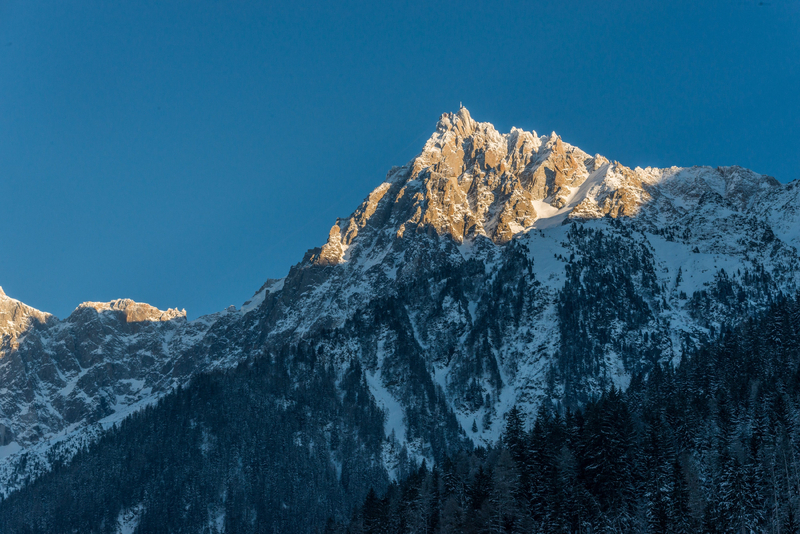 The elevated position up on the South face of the valley, right under Mont Blanc gives fantastic views up to the mountains and down over the Chamonix valley. 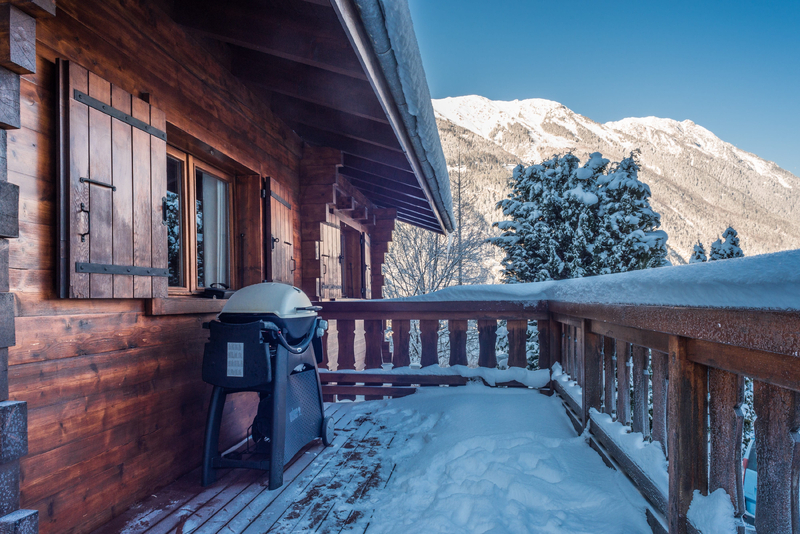 There is a large suspended terrace with large gas BBQ and seating for 8 people or more, fantastic in the summer for relaxing and dining outside. 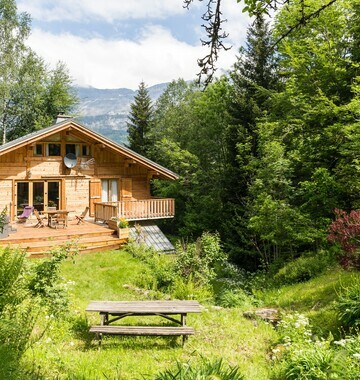 The private mature garden is lovely and gives great views up to the waterfall that cascades down behind the chalet. 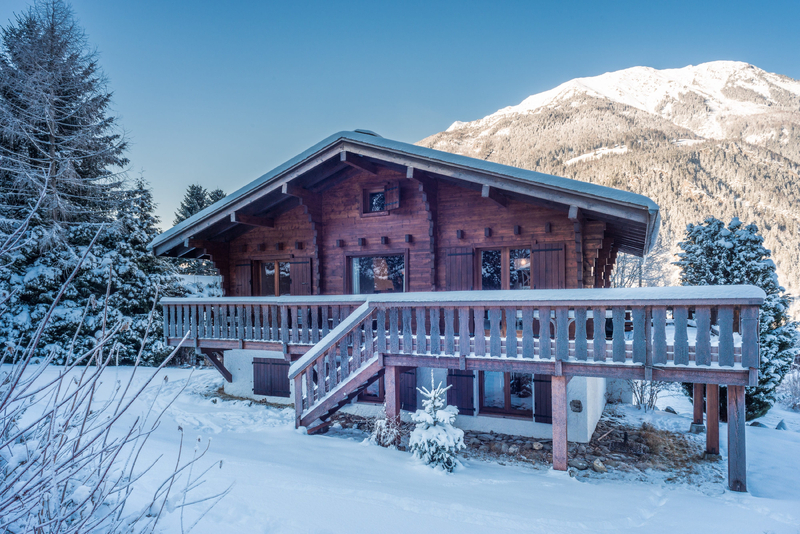 This charming alpine chalet boasts 4 bedrooms, 2 permanent doubles and 2 more bedrooms that can be either double or twin rooms. 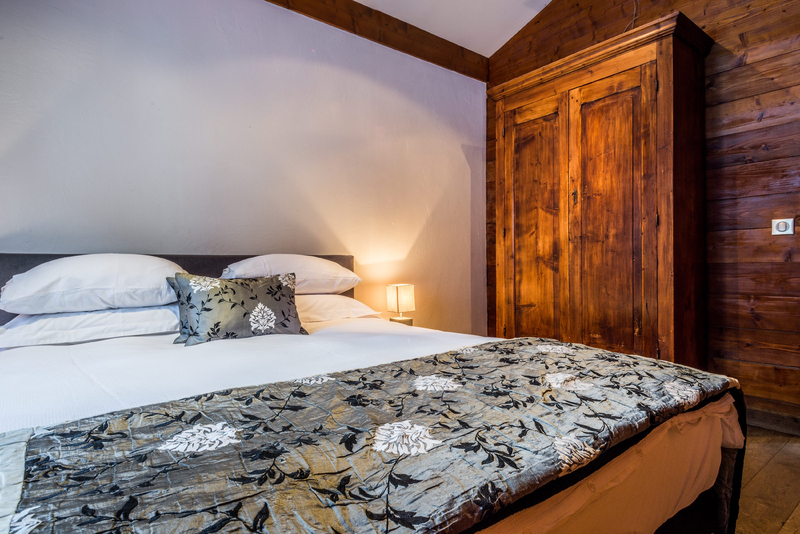 Quality linen and towels are provided and the beds are all new and very comfortable. 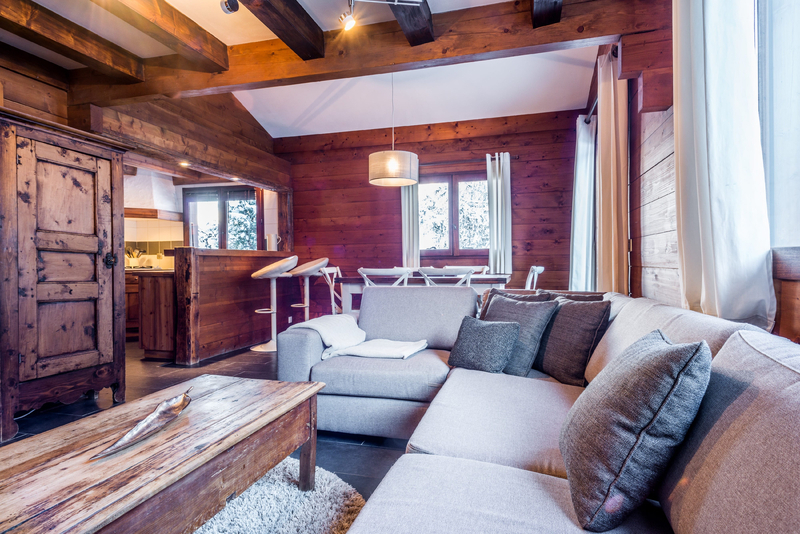 The living area is practical with a smart, large sofa, flat screen TV and office area. 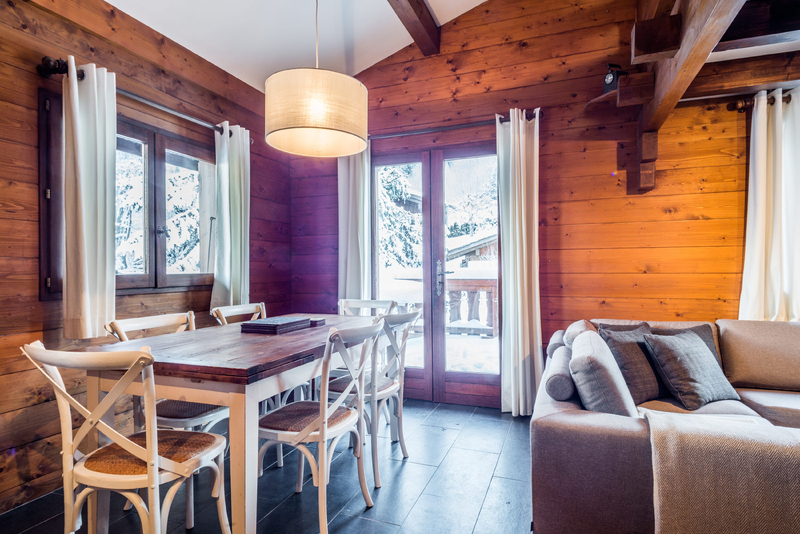 The dining area has seating for up to 8 people and the kitchen is well equipped for families and groups. 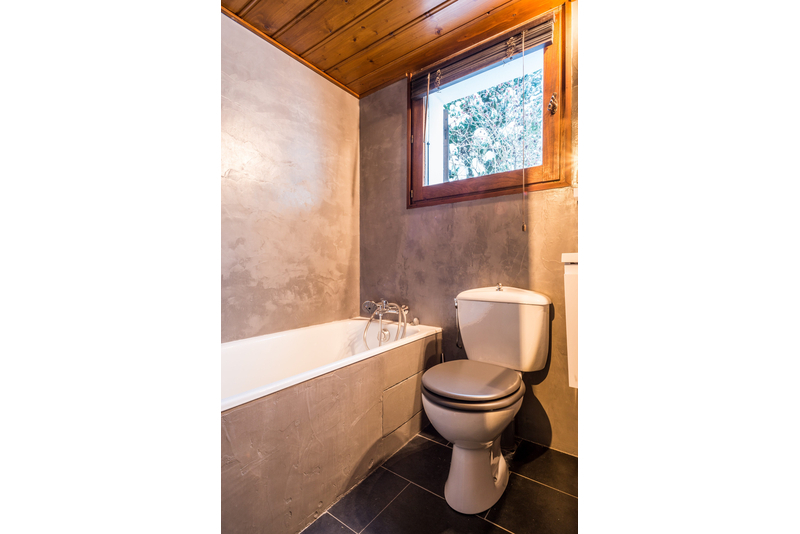 Each floor has a bathroom with bath, hand shower and separate toilets. 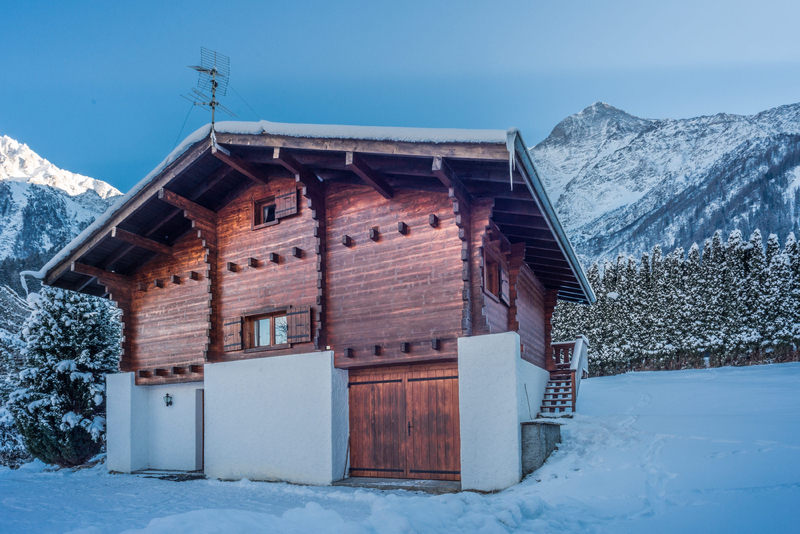 The garage acts as a heated ski and boot room and for other storage such as bikes and there is off road parking for up to 4 cars. 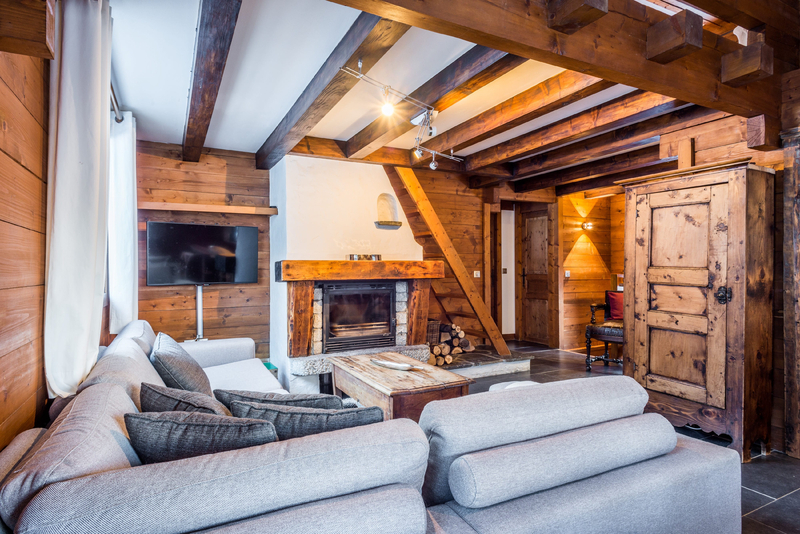 Wood for the fire is provided at no extra cost. 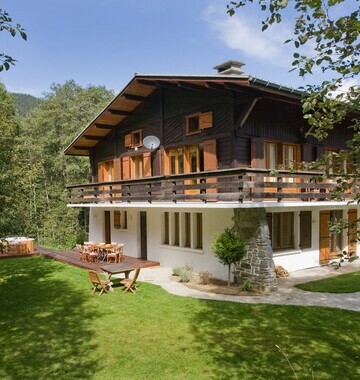 You can see the exact location of Chalet Charme on Google maps. 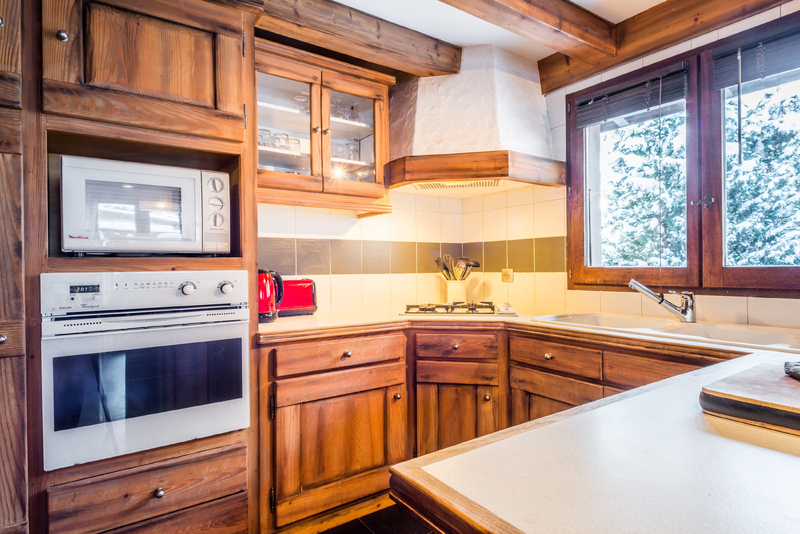 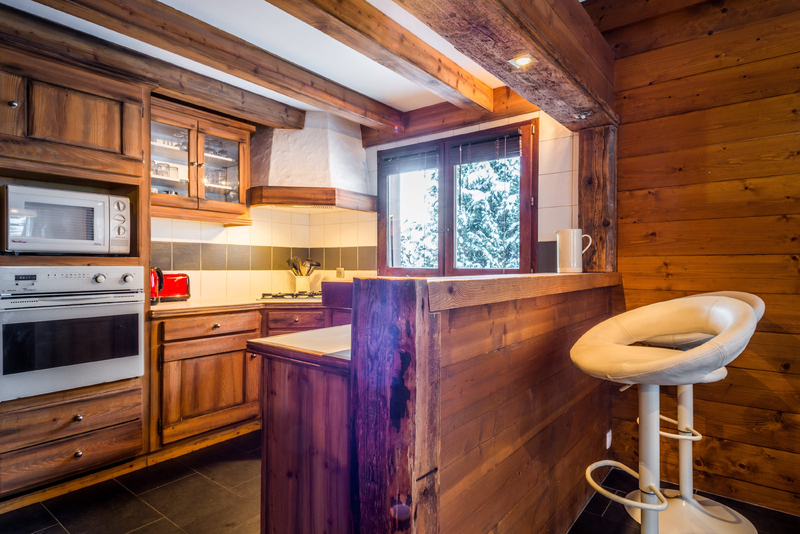 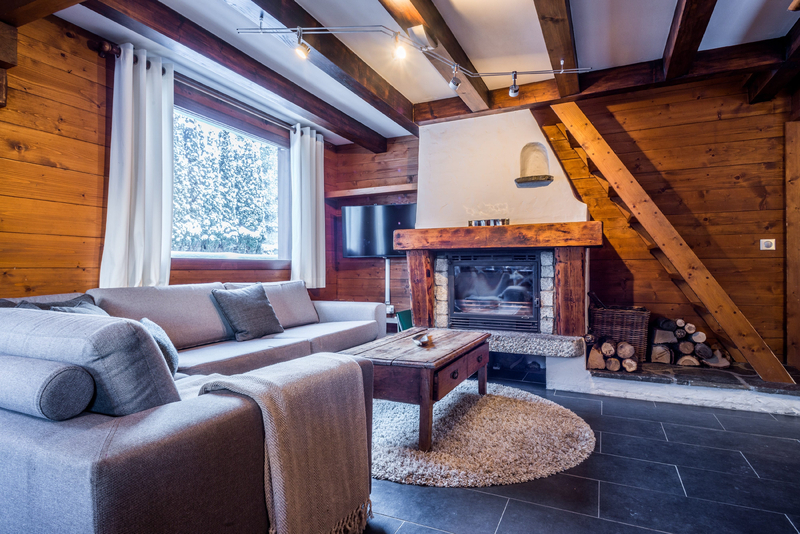 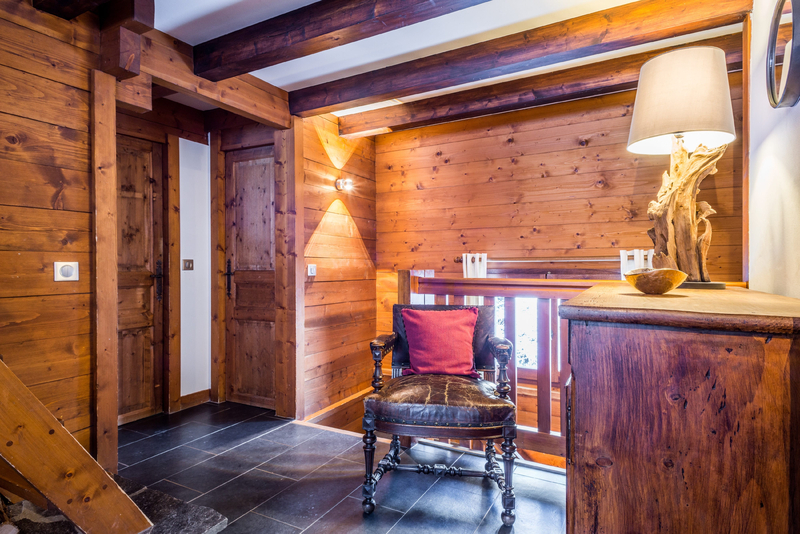 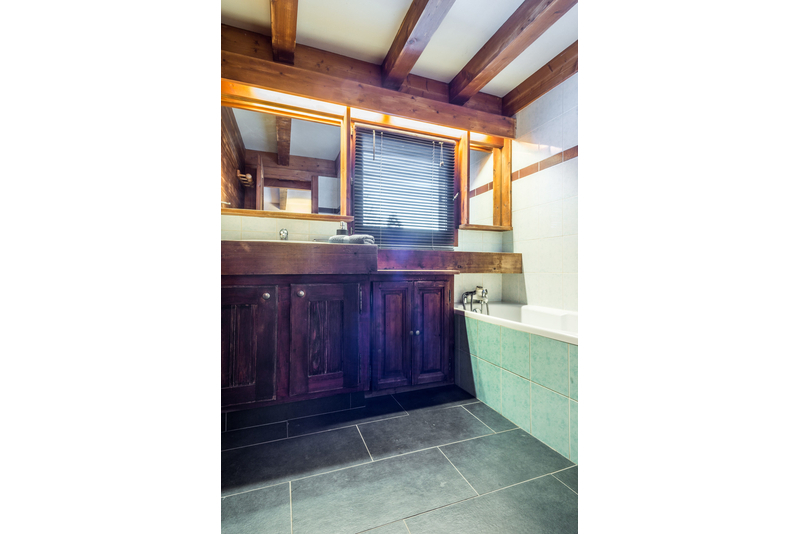 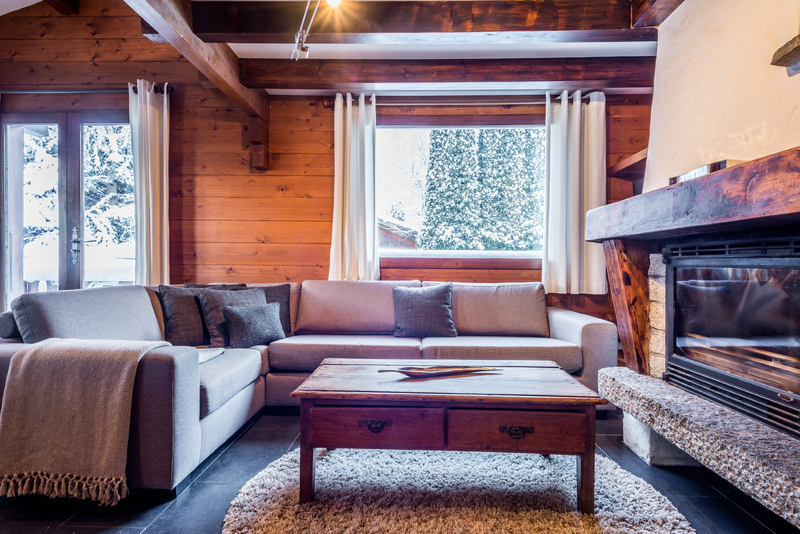 This charming chalet is located in Taconnaz right next to Les Houches. 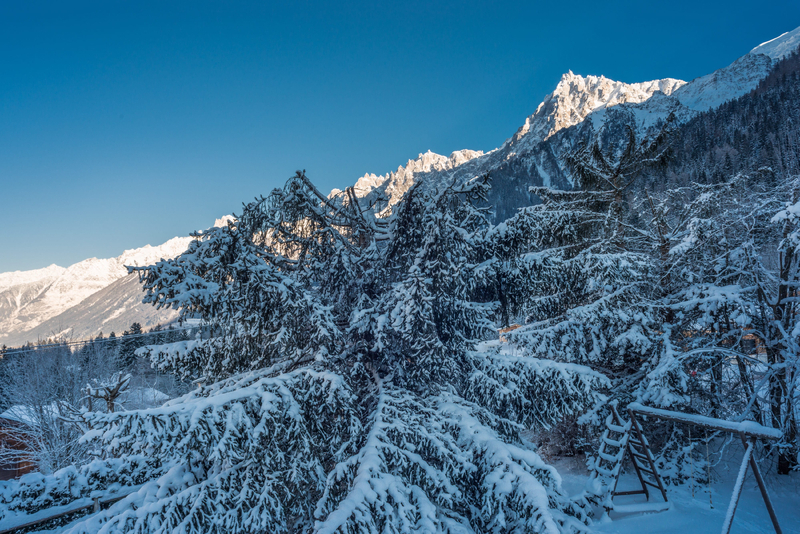 The elevated position up on the side of the Chamonix valley provides fabulous views but all the facilities are minutes by car. 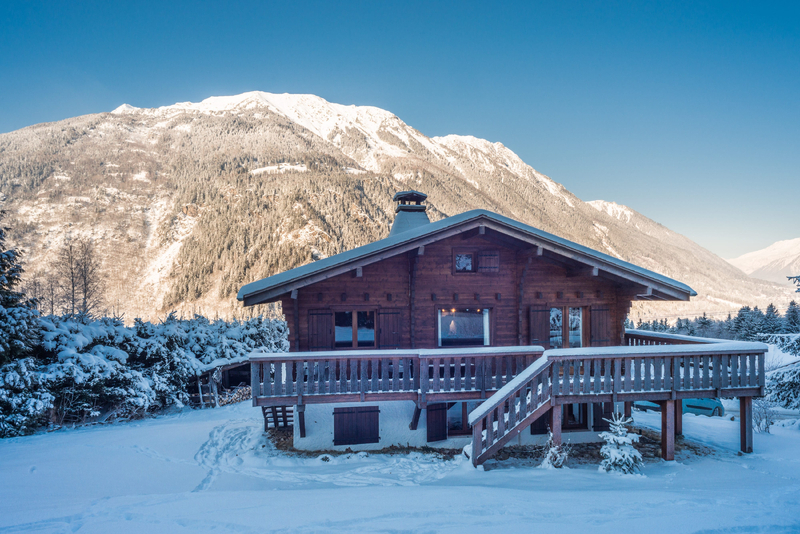 Access in winter by car is not a problem as the road and driveway are professionally cleared of any snow. 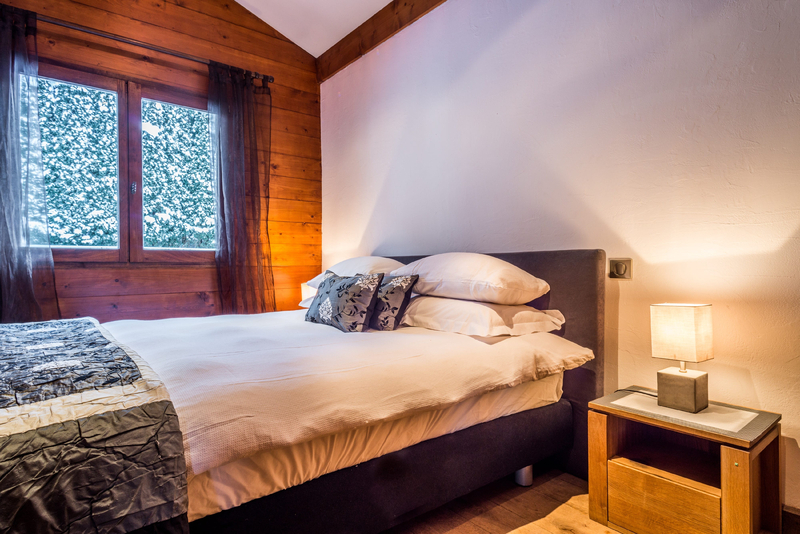 Les Houches centre is 10 to 20 minutes walk or alternatively you can catch the bus or train. 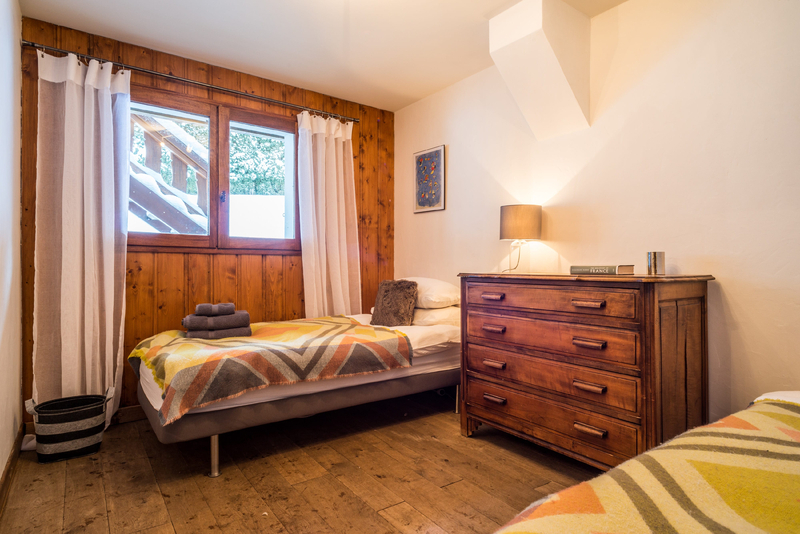 The nearest bus stop is 5 minutes walk and regular buses go to all parts of Les Houches or Chamonix and beyond, you can also catch a train from Les Houches. 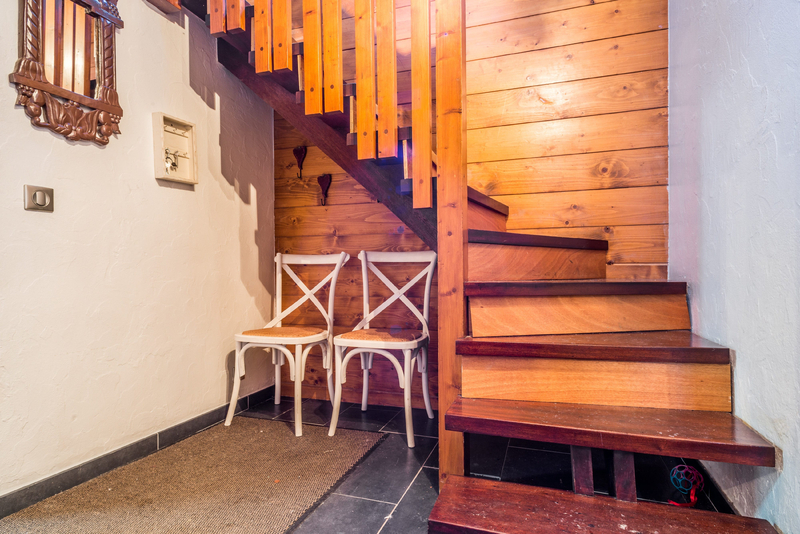 Alternatively please ask us and we can help arrange airport and in-resort transfers for the duration of your stay. 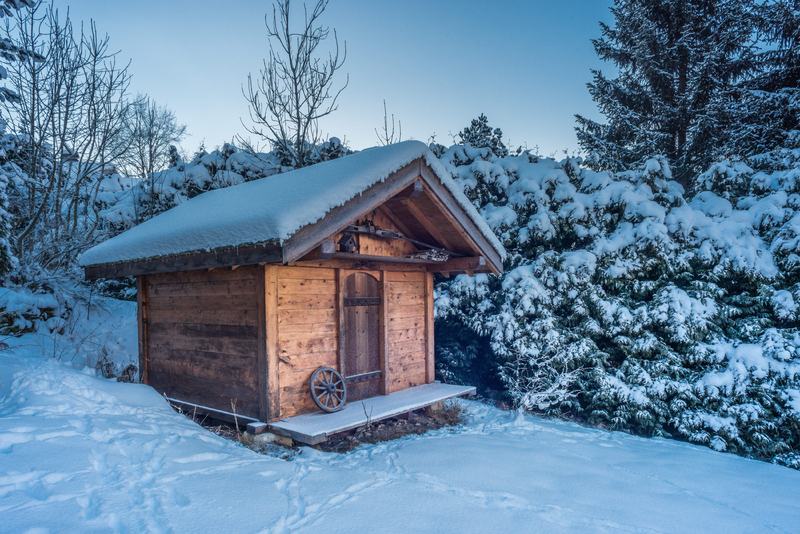 Enjoy the peace of the forest only 5 minutes from the lifts.